The families gathered together, with various members of the next generation in attendance. The event took the form of a tasting followed by lunch. None of the 22 wines from the tasting were removed during the course of the lunch, so it was possible to note their development in glass over four hours in total, a wonderful context in which to assess these wines. Of course my scores for the wines are high, for these are some of the world’s finest wines from great terroirs, and most of them from sublime vintages. Each producer showed two wines, one from a recent vintage and one from a historic vintage. 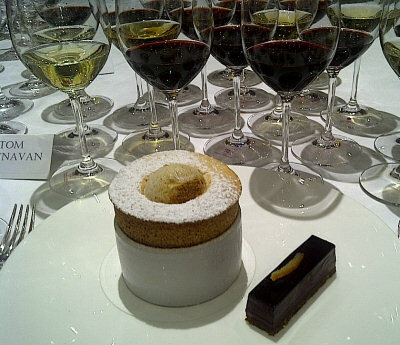 The photo shows The Square’s Bitter Chocolate Pavé with Seville Orange Soufflé and my tasting samples. Because of the nature of these wines, many of them are still available, even the older vintages through specialist merchants and auction houses. Prices are eye-wateringly high in some cases, but then the younger vintages of several of these wines are relatively affordable. Given that almost every one of them has substantial cellaring potential they could be a very attractive propositions. Wine-searcher links are given for each wine, and a purely indicative price. Beautifully deep, toasty, Seville orange and brioche nose, a touch of yeasty and citrus freshness. The palate has lovely weight and rolling, mouth-filling mousse. The sourness of the apple and orange acidity streaks through. Gorgeous length and sense of completeness. 93/100. Around £55.00. See all UK stockists on wine-searcher.com. Fantastic minerality here, real smokiness and river stone freshness. The palate is crisp, the mousse fine and racy, and it has a lovely hint of vanilla and honey richness. Fantastic acidity, really fresh and long, not fantastically complex, but delicious. 93/100. See all UK stockists on wine-searcher.com. Hugely deep, aromatic nose of Brazil nut and coffee, there’s a fabulous perfume and power here, of minerals and wet stones, with little floral nuances. The palate has a touch of honey and toffee, with lovely texture and limpid weight, the beautifully poised acidity giving a savoury edge with an almost meaty power and huge length. 95/100. Around £395.00. See all UK stockists on wine-searcher.com. The nose is deep and sensuous, lots of briar and truffle and lightly earthy and gamy notes, the fruit fading very slightly, but more than compensated by that delicious focus and hint of honeyed opulence into a very long finish. 94/100. Around £600.00. See all UK stockists on wine-searcher.com. Big, deep, golden colour. Heavy, limpid weight of opulent dried fruit and barley sugar. There’s a meatiness too, as well as the glycerine-rich, opulent fruit. Fantastic palate, thick and unctuous, but brimming with fruit that has fantastic depth and creaminess, coating the mouth but not without the acidity balance. Hedonistic. 95/100. Around £135.00. See all UK stockists on wine-searcher.com. Fascinating nose, with some custard and mint, and lots of leafy green herbs – a real note of basil. The palate has sweetness and a huge core of acidity. It is perhaps a little pinched by that acidity, but some toffee and chocolate depth adds intrigue. It is perhaps just a little past the moment when I would have loved it, but fascinating and complex. 91/100. Around £135.00. See all UK stockists on wine-searcher.com. Massive nose of honey and flowers, from a vineyard planted in 1910. Enormous perfume and concentration. Touches of green bean vegatility too in such a complex profile. The palate has equal richness, with plenty of bitter twists of lemon rind and grapefruit against the inherently sweet fruit and opulent, dried apricot richness. Fabulous, mouth-filling stuff, power and a touch of heat, but will age for decades. 93/100. Around £95.00. See all UK stockists on wine-searcher.com. Lots of spice and game here, the meaty, bloody character of the Mourvèdre powerful and deep. The spices and very deep bramble and plum fruit comes through, as it does on the palate which has a fat, sweet fruit base that is mouth-filling and rich, but the spices and tannins and the beautiful edge of acidity and fine, grippy um skins is delightful and long. 94/100. Around £150.00. See all UK stockists on wine-searcher.com. What a beautiful nose, with flowers and dried fruits, more juicy plump apricot coming through. Fantastic complex, subtle notes of salts and minerals amongst the pretty opulence. The palate is ravishing, with fabulous texture that is silky without being weighty, and which supports the lovely acidity. Delicious and enormously likeable as well as being very “serious”. 97/100. Around £375.00. See all UK stockists on wine-searcher.com. What an extraordinary colour – tawny brown, its 6% alcohol only. Raisins and the dried Botrytised berries. Coffee and chocolate too, with the palate medium bodied and intensely sweet. Fig, honey and wonderful glycerine richness, this has enormous intensity and concentration, yet absolutely ravishing acidity, the cleansing length of the finish is extraordinary. 96/100. Around £3,500.00. See all UK stockists on wine-searcher.com. Beautiful nose of cedar and fine cinnamon spices over very pure, fresh black berries. There is a little gamy development, but the spicy fruit comes through so powerfully. The palate has a dusty blue-black weight of fruit, good ripeness and a real sense of juiciness. Delicious stuff. 93/100. Around £180.00. See all UK stockists on wine-searcher.com. Gorgeously smoky, earthy and elegant nose, with exotic sandalwood spices too, but the cassis and blackcurrant freshness powers through in this young wine. Alluring perfume, leading on to a bold, balanced palate, with a chewy streak of tannin and acidity joining still slightly raw oak at this stage. Fantastic freshness and richness, this already delicious but needing a few years to totally integrate. 93-94/100. £180.00. See all UK stockists on wine-searcher.com. Much deeper, more earthy and more animal than the Solaia, with coffee and plum depth and a truffle and game allure. Seems really quite mature on the nose, and leading to a rich, velvet-textured and powerful palate. The sweet fruit is powerful and concentrated, with a big tannic framework. 93/100. £180.00. See all UK stockists on wine-searcher.com. This magnum was, for me either a little corked or had a touch of green, slightly resinous quality. The palate has good fruit and the balance is good, but this ultimately is a little short and relatively simple. 90/100. £165.00. See all UK stockists on wine-searcher.com. Gorgeous lift to this wine, with much more of a cherry and red fruit brightness, lots of exotic incense notes and just fine, delicate floral aromas. The palate is all edge and agility against the Sassicaia’s fuller, meatier depths, but has superb structure and focus. One to age for a decade or more. 93/100. £30.00. See all UK stockists on wine-searcher.com. A little dank, a little meaty, but then the beautiful fruit sweetness begins to bloom. A little herbal note too. The palate is elegant, the fruit fading into the background a touch, but again its charms begin to win, the juicy acidity not difficult and the balance still good. 91/100. See all UK stockists on wine-searcher.com. Fantastic impression of sweetness, with a touch of roasted chestnut and black berries, touches of saddle leather and truffle too. I love the sour cherry thrust of the fruit and acidity here. The balance is impeccable, the fruit still there, the sweet smokiness swirling through the finish and the tannin and acid nice and tight. A lovely wine. 95/100. £830.00. See all UK stockists on wine-searcher.com. The game and bloody perfume is beginning to develop here, a very fine, racy ash and smoke note over refined black fruit. The berry richness suggests great ripeness. The palate has delightful balance, with very acidity and intense concentration, but the tannins and lovely length of the wine show brilliant harmony and huge potential. 97/100. £950.00. See all UK stockists on wine-searcher.com. Such a deep colour here, brown on the rim but ruby at the core. The depth of sensuous, blood streaked game, coffee and gamy notes. There is the peppercorn and herbal note too, some olive, in a hugely complex profile. The palate too is sensational, the medium bodied finesse of the savoury, still tight lack fruit woven with smoke, sweet, suede-like tannins and decisive acidity. This wine shimmers with life and vitality, the orangy tang of the acids and creamy ripeness of the fruit still there, even amongst the developed nuances of game and coffee. Fabulous, and extraordinarily long. 98+/100. £2,000.00. See all UK stockists on wine-searcher.com. A wisp of smoke and a touch of liquorice and plum are the immediate impressions, and spirit way in the background. Bottom notes of chocolate and trills of flower and kirsch add slowly developing complexity. Fantastic silky texture and pure, ripe, chocolate-deep black fruit. Coffee and a delightful twist of liquorice into a hugely long finish. What a wine, and what potential. 96/100. £60.00. See all UK stockists on wine-searcher.com. What a gorgeous colour, bright, but palate and translucent ruby. Hugely complex nose, tar and wild flowers, espresso and truffle, some menthol and leafy briar and woodland. No spirit on the nose. The palate is just beautiful, extraordinary vitality and energy, the berry fruits and the refined chocolate-touched tannins, all the sweetness there. 97/100. £160.00. See all UK stockists on wine-searcher.com.